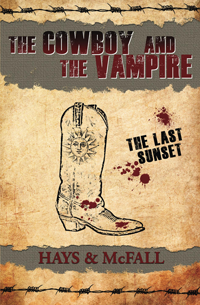 The Cowboy and the Vampire: The Last Sunset won a 2017 IPPY award. Read more about the book below! "Take one long, last look at LonePine, Wyoming, population 438. It’s been two years since the vampires quit the quirky little town and things are mostly back to normal — broken dreams and never enough whiskey. But that’s about to go to hell. "Hold on tight for a midnight showdown when a psychotic religious order takes the entire town hostage — including Tucker's long-lost brother — to lure Lizzie from her frozen exile in Russia. The mad monks know Lizzie’s murder will strand the ruling vampire elite in a disembodied afterlife so the cult can impose their twisted beliefs on the living and undead alike. It’s a rip-roarin’ stampede as a cowboy and a vampire try to round up the shattered pieces of their unusual romance. With the fate of the world on the line (yet again), can Tucker and Lizzie put aside their broken hearts to face one last sunset together? Slap leather or reach for the sky."